In observance of Edita’s Gruberova’s 50th anniversary in opera, I would like to offer a series of commentaries, over successive days, of my favorite performances. Bellini’s final opera I puritani is awash with one Bellinian trademark melody after another: every character has what you might call a “hit tune.” Or two. No less are the series of rousing, applause-engendering duets. If Pepoli’s risible libretto provides a weak basis for dramatic credibility, Bellini comes through with a sensational score of the utmost imagination and tuneful splendor. In this scene, Arturo, Elvira’s intended, has fled the premises with Queen Enrichetta, to help her escape being a prisoner. Riccardo, in love with Elvira, thinks that Arturo is running off with Enrichetta, and informs the populace of this. Elvira, believing Arturo has deserted her for another woman, becomes despondent and depressed (best not to look too deeply into this incredible plot turn). The scene here begins with Riccardo’s announcement of Arturo’s departure. Elvira, and the townspeople arrive amidst a flurry of confusion. Bellini creates a memorable effect, the orchestration swirling with suspense, with Elvira exclaiming, “Dové Arturo?” With Giorgio’s entrance, “Gia fuor delle mura,” the key modulates from G to F major. A striking moment is when Elvira’s desperate “Ahimè!” ascends twice to a high C over the chorus. Her mournful, pleading cry, covering two octaves, “Ah vieni!” begins the larghetto sostenuto proper. Bellini’s instruction for “Oh vieni al tempio” is for the soprano to declaim this “with all the impulse of an innocent, contented heart.” Elvira, in her delirious state, is imploring Arturo to “come to the temple” as they exchange vows and pledge eternal love for each other. The other characters and chorus comment solemnly and dolorously upon her deluded state (it is hard not laugh whilst writing these words; but… there is no other plausible way to describe it). The number is a brilliantly effective one of Elvira’s tragic meanderings, punctuated by the responses of Riccardo, Giorgio, and the chorus, all interweaving each other to extraordinary effect. 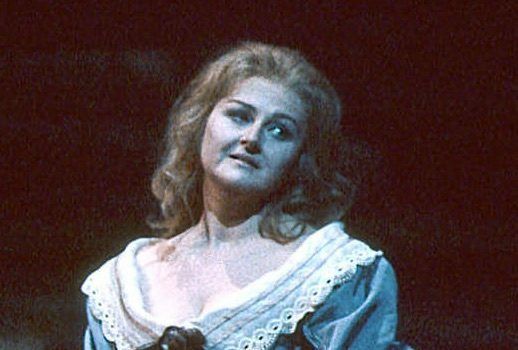 Gruberova sang her last Metropolitan Opera performances in I puritani, which occurred in March and April of 1991. By my estimation, this is her finest documented assumption of Elvira, of which there are at least a dozen various commercial and live performances out there. Gruberova worked here with Richard Bonynge, as well as on several occasions, and in all of them, perhaps due to his astute coaching, she has turned in some of her most outstanding work. Pride of the top place is this performance of “Oh vieni al tempio,” from the Saturday afternoon broadcast of March 30, 1991. I saw two of the run of these performances in the house. I will never forget the impact of Gruberova’s singing. Planted in the middle of the stage in a kneeling position in her lilac-blue dress, she suspended me in time with the beauty of her vocalism and phrasing. This clip provides the rare instance of her voice being captured at its most lovely and congenial. All too often, the close, relentless digital microphoning in studio engineering imparts an unwelcome glare and hardness of tone not apparent in the space of an opera house; her “frontal,” resonant timbre does not lend itself well to the recording process. Not so here. Rarely has the tone sounded so shining, yet soft, warm, shimmering with radiance as heard here. As she traces through the superbly well-bound line, Gruberova offers a gorgeous, purling sweetness, with exquisite word-painting and gentle, dynamic shading. Several isolated moments are worthy of mention. At 3:18, in the “Ah vieni!” she crowns the high C in the scale with an impressive diminuendo, not just showing off technical prowess, but imparting Elvira’s heartbreaking grief. At 7:30 Gruberova takes the “traditional” option of taking the line up, whereby the soprano rises up to a high D. Bonynge’s long-standing handling of this section is an ingenious one; he allows the soprano to approach it gradually, not rushing it, with the soprano holding the high D. It is a glorious, thrilling effect. Gruberova here stuns with the security of her upper register, and how effortlessly she soars over the entire chorus. Just as impressive is the deft handling of “coming down” from the upper straits, never losing the focus. One of the most singular, extraordinary moments I have ever heard from Gruberova, though, comes in at around 8:23. The concluding cadenza, “Vivro d’amor,” has the soprano starting the scale on a b flat marked with a fermata. Bonynge holds the chord for Gruberova; and then, seemingly out of nowhere, she comes in on the b flat with the most soft, but sustained of tones, and then executing an absolutely perfect messa-di-voce; and then does the peculiarly Bellinian, “dying fall” of a scale, all on one breath. She ends this, departing with the score, at 8:51, with a superb, slow trill, absolutely exact and precise, and tapering off with a beautifully sustained ending, of the utmost loveliness.